Diseases of the respiratory tract as recurrent airway obstruction, laryngeal hemiplegia/hemiparesis and disorders of the guttural pouches are a common problem in our horse population. A thorough clinical investigation of the respiratory tract contains auscultation during rest and after strenuous exercise as well as acoustic percussion of both lung fields. 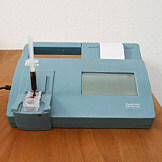 Arterial blood gas analysis is necessary for investigating pulmonary function. We measure arterial tensions of O² and CO² to quantify the lung`s ability to oxygenate and remove CO² from pulmonary arterial blood in cases of poor performance. 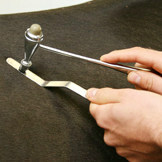 Arterial blood sampling is performed from the carotid artery in the distal third of the neck. 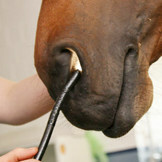 Endoscopy is the technique of choice to examine the pharynx, larynx, guttural pouches, trachea and main bronchi. With the help of the endoscope we are able to take tracheobronchial washings and aspirates for cytological and biochemical analysis. Radiography and ultrasonography are also additional useful diagnostic tools for the evaluation of many parts of the equine respiratory tract. 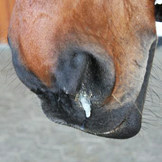 Respiratory airway obstruction is a well known disease in our stabled horses. Clinical signs are non-specific and include different types of nasal discharge, coughing, exercise intolerance and labored breathing. Inflammatory airway disease (IAD) describes a lower airway inflammation, which does not result in episodes of labored breathing. 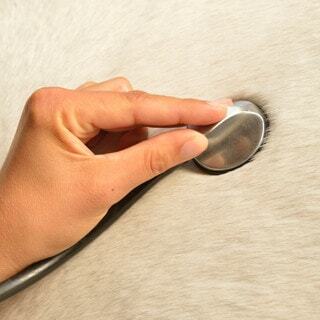 Alveolitis and interstitial pneumonia are sporadic respiratory diseases in horses going along with different degrees of changes of the pulmonary tissue.